We get the Sunday Times every weekend. And occasionally the Times on a Saturday too. Last weekend the Times promoted that it had recipes for Bank Holiday baking. So, of course, I didn’t see much of the rest of the paper (apart from the utterly ace column by Caitlin Moran). I was kinda sniffy about the Bank Holiday Baking initially. I mean, it’s just the very beginning of May and the first thing I’m being encouraged to bake is Blackberry and Crumble Cake. Now, I’m sure the Blackberry and Crumble Cake is lovely, but brambles are seasonal fruit, and this really is NOT their season. Get real cookery writers! And please stop encouraging supermarkets to stock fruit and veg that is out of season – it is more expensive to produce and ship and probably doesn’t taste as good. Then I moved on and spied Pear Cakes with White Chocolate, and Lemon Curd. I had literally just made some lemon curd (in a bid to do something else with our glut of eggs – my girls laid seven in one day earlier this week). And I’d just bought some pears. Yup, I know, pears aren’t in season either. But there they were on the shelf at the farmshop, and they looked delicious. And they store better than brambles, so perhaps it’s not quite so mad to buy them out of season? Anyway, given that I clearly don’t have a leg to stand on in the ‘seasonal rant stakes’ I’ll move on. The recipes are all from Andrew Dargue of Vanilla Black. I’d never heard of Vanilla Black before, but now I’ve looked at the website, they are ‘Michelin-recommended’ and they have a book coming out this week. So that’ll be why I’ve seen his recipes in various places. 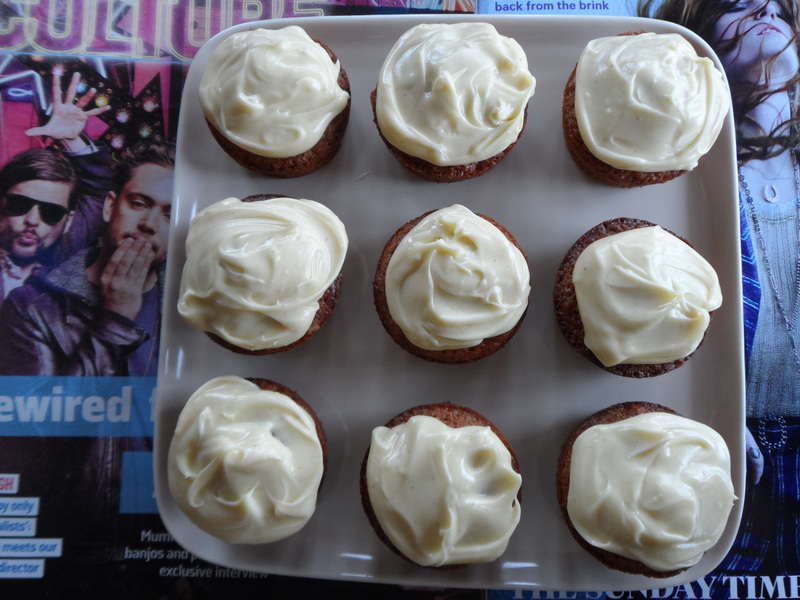 I made the Mini Pear Cakes, complete with white chocolate frosting, but something made me add a slug or two of gin to the frosting. And it was ace. This weekend I made the cakes again, adding some gin to the cake batter too, and took them along for the volunteers at the wonderful Boswell Book Festival. It wasn’t an entirely selfless act, supporting both the literary and volunteering community, for I wanted to see Capt Eric ‘Winkle’ Brown give a talk. He’s the most remarkable man – he has flown more different types of aircraft than any other person, living or dead. And it is unlikely (allegedly) that his record of 487 aircraft will ever be beaten. He also interrogated a number of Hitler’s henchman, including Goering, Messerschmitt and Himmler, and the Commandant of Bergen-Belsen concentration camp. His description of what he witnessed at the camp, in its last few days was incredibly moving – after almost exactly 70 years to the day he still can’t stop smelling the stench of the dying and near dying in that awful place. But anyway, I digress. 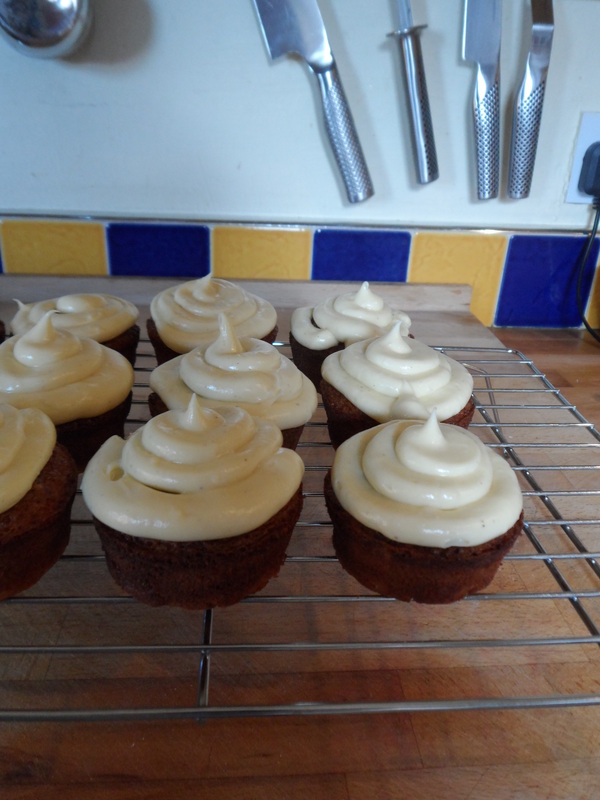 These cakes were just going to be called Mini Pear Cakes with Gin and White Chocolate Frosting. yes GIN! But they clearly need to be called the Boozy BozzyFest Cakes instead. They are utterly delish. I’ve adapted the original recipe, but only slightly, so thank you The Times and thank you Andrew Dargue. These rock. And so long as you use GF baking powder, these are gluten free badboys. Preheat the oven to 155C / GM3. Grease a large muffin tin – this quantity works well for 12 proper-sized mini cakes. Don’t bother with muffin or cake cases, you don’t need them if you prepare the tin well, with lots of butter to prevent the cakes from sticking. The batter is pretty runny, but don’t worry – it’ll work out. Spoon the mixture into the prepared muffin tin, filling each hole about two thirds of the way to the top. Bake for around 20-25 minutes, or until firm to the touch. Leave to cool for 10 minutes or so in the tin, then use a knife to run around the rim of each cake to loose them from the tin, and turn out onto a wire rack to finish cooling. For the icing: melt the chocolate in a microwave on the lowest power setting, or in a bowl over a pan of hot water. Beat the butter and icing sugar together. Add the gin. Smoosh the icing on to each cake or if you want to be a bit posher, pipe it on (it’ll look smart but not too twee if you use a plain round piping nozzle). Want other recipe ideas? Take a look at my index of recipes. It’s got everything from croutons (I kid you not!) and boiling an egg (twice) to spicy turmeric chicken, which I’m going to eat tonight. Oh, and more recipes for brownies than is strictly necessary.